Promote books you have written and published to visitors that come to your page. Show other members what types of material you like to read. Provide your connections with recommendations of books you have enjoyed. You can access your bookshelf by clicking the BookShelf option in the manage drop-down. 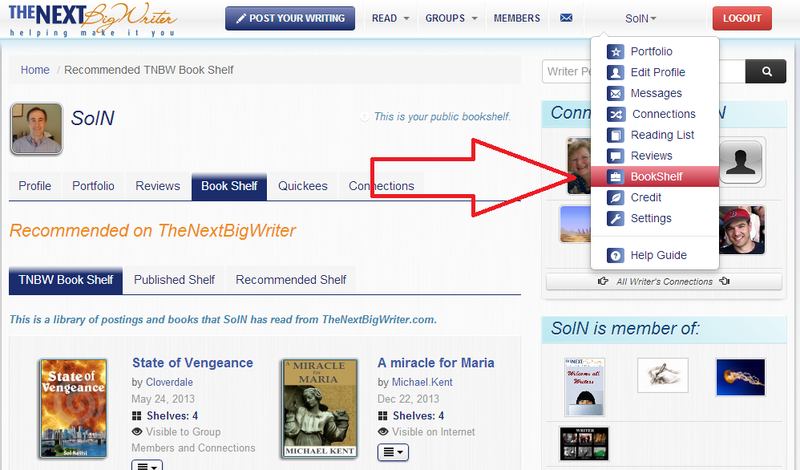 TNBW Book Shelf - This tab allows you to shelf content posted on TheNextBigWriter that you have read and enjoyed. Published Shelf - This tab is for you to add books that you have published yourself. Because the shelf technology draws books from Amazon, your book must be on Amazon to be added to this shelf. Recommended Shelf - This tab is for books not written by you that you have read and enjoyed and would recommend for others. 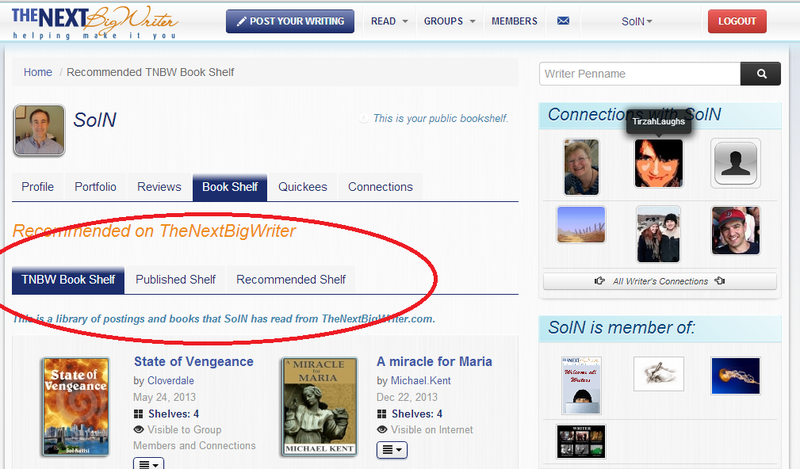 You can easily add TheNextBigWriter content to your shelf by clicking the Shelfit button at the top of all posted content. After you have Shelved it, you can also leave a note explaining why you have added it to your shelf. 1 If you already see the book on the site (for example on the homepage or on someone else's shelf), you can add it to your shelf by clicking the Shelfit button. You can also add a comment. 2 If you do not see the book on the site, you can add it by doing the following. a Go to either the Published Shelf or the Recommended Shelf. b Search for the book using the search box. c Find the book and click on the title. d On the Amazon page, find the ISBN-10 number or the ASIN and copy it. e Go back to your shelf page and input this number into the box that says: Input new Amazon book ISBN 10 number or ASIN Code. f Select whether it should go on your Published or Recommended shelf. g Click the Shelfit button. Once the book has been added, other users can add it to their shelf simply by clicking the Shelfit button on the book you have added. Once book has been manually added to the site, it technically does not need to be added again if everyone uses the Shelfit button. Once you have added a book to your shelf, it will appear on the homepage of your connection's homepages. This allows your connections to see what books you have published and what books you recommend. They can then decide to Shelve the book and it can be seen by their connections. This creates a chain of Shelves which can quickly put it in front of hundreds if not thousands of writers and readers.